We were sitting quietly at our office in Bullhead City, AZ. 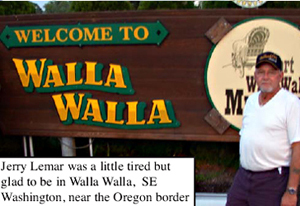 when we received a plea for help from Jerry and Lee Whited from Walla Walla, WA. 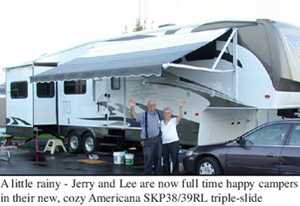 They had been shopping for a 4 seasons fifthwheel that was comfortable, well built and extremely well insulated, as it gets very hot and very cold in Walla Walla. Americana was their final choice but they didn’t have 12 weeks to wait for a new one to be built for them. The Whited's had decided to sell their house and become full timers. The “word” got out, that their very nice home was going on the market and it sold before it was listed. Their single-slide Cougar (shown below right) was ok for weekends, but, as they told us, it was too hot or too cold to live in and was very cramped.Could we help? Our comptroller had just released an SKP38/39RL for sale and they told us they wanted it, if we would install a washer/dryer and King sized air mattress sleep system (we did). Jerry Whited was still working as an engineer for a major grain company in town and couldn’t take the time to come down to Arizona to pick it up. So, being adventurous and very accommodating fellows, Americana’s Russ Anderson and Jerry Lemar decided that they would take a “bus-man's holiday” and transport the SKP38/39 display model to Walla Walla for the Whited's. We're pleased to say that the Americana towed so smoothly that it was hard to tell that it was behind us. Most of our towing was in mountainous terrain with constant 6 and 7% road grades. We set the F350’s cruise control on 60 MPH going up and 65MPH going back. When we arrived inWallaWalla we calculated fuel used for the towed trip. We showed the results to the Whited's, who were happily surprised. They told us their current 3/4 ton gas pickup could barely get 10 mpg, running empty. The trip up towing averaged 9.5 mpg and returning empty averaged 18.3 mpg. Not bad for that big crew cab horse, running through all those Western mountains. What a comfortable tow vehicle it is. It also handled like a sports car, while taking all those mountainous curves. (we expected excellent fuel economy towing that big 40 footer, as Americana is the most aerodynamic, relatively light weight and smoothest towing 4 seasons fifthwheel available). Based on our customer’s reports, we know that current GMC & Dodge Turbo Diesels perform similarly or even better.